Welcome to another episode of #ThatBusinessShow with your Host, Jamie Meloni! On #ThatBusinessShow, we pride ourselves of inviting local business people, entrepreneurs, and all sorts of talent to promote themselves on the #MorningAir! Which is why we had a bit of a different show for our listeners today. We had live musical artists to share their talents with us! Also joining us was our lovely Co-Host, Stella Guidicelli! Rocking her country gear, she came into the show with jean-everything and even cowboy boots! Fitting, as our musical guests were both from the country and folk fields. 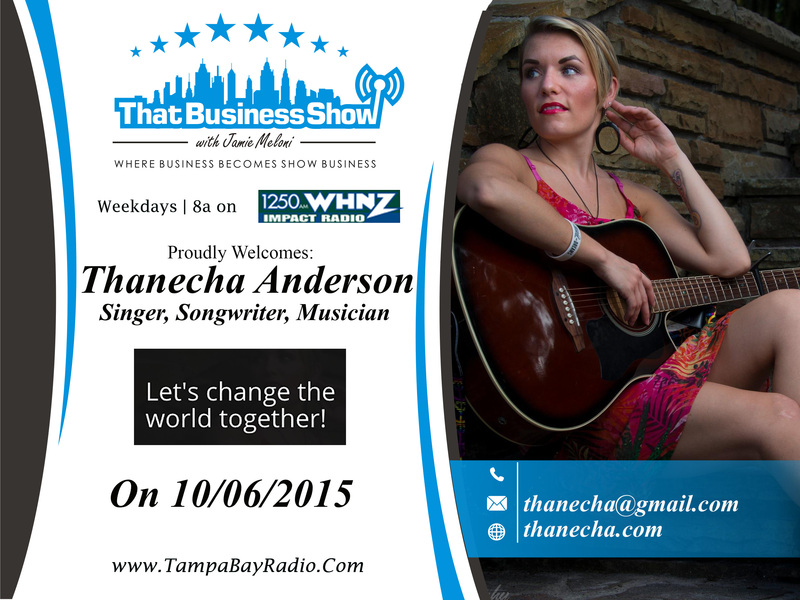 Coming on the “First act” of #ThatBusinessShow was Thanecha Anderson, with her touching story of poverty and inspiration. Joining us for the ‘Second act” was Billy McKnight from The Soul Circus Cowboys. We hope you enjoyed today’s episode of #ThatBusinessShow with our Hosts, Jamie Meloni and Stella Guidicelli. If you missed the show, head to http://www.tampabayradio.com or to my YouTube Channel at http://www.youtube.com/jamiemeloni to see the live footage! There truly is no story like one of extreme poverty and eventual success. However, our guest Thanecha Anderson has a twist. Not only did she come from an extremely poor family, living in shelters and even living in cars and even school buses; but she has no turned her success back to her past in order to help others who are in the situation that she was in. As an advocate for humanity and equality, she uses her music to inspire people to be kind and to foster a positive wave of energy in the community, to help those in need. Next year she will be engaging in a nationwide tour, starting here in Tampa Bay and eventually reaching the homeless shelter in Las Vegas where she lived in when she was five years old. Her aim is to inspire the kids that are there to look forward to the future, that they will not always be in poverty and that their dreams are one hundred percent valid. Singing original songs for us on the #MorningAir, she showed our listeners her ability to be a songwriter, and her angelic voice. Truly, this one wasn’t one to miss! If you want to see her performance again, head to http://www.tampabayradio.com! Our next guest was Billy McKnight, header of The Soul Circus Cowboys! They pride themselves on their genuine sound, being as real as hard leather! They describe their music as Country with a Southern Rock feel with a lot of energy! Coming soon is their new album, “Tailgate Country” in which they have “defined their own genre” within their new modern country sound. They came on #ThatBusinessShow to preform three of their songs, two written by Nashville royalty Craig Wiseman and Jim Collins. 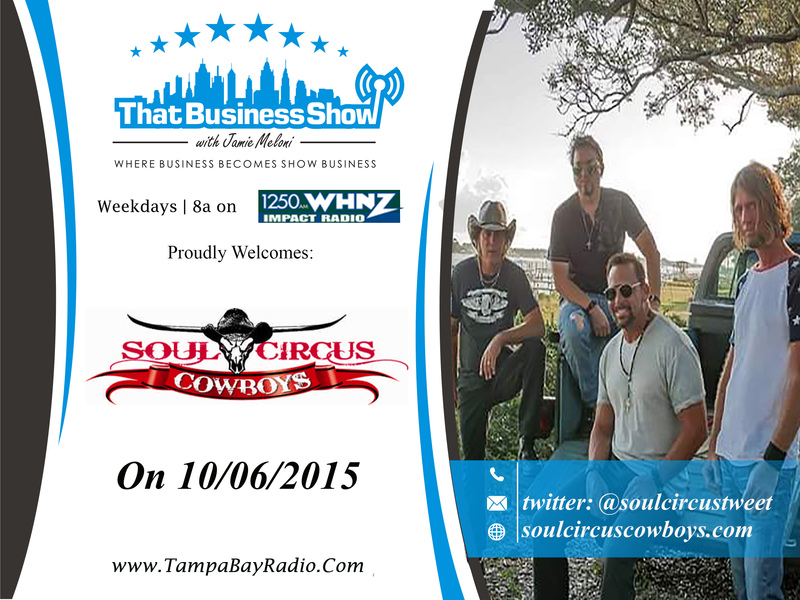 If you missed Billy McKnight and The Soul Circus Cowboys, make sure to head to http://www.tampabayradio.com to hear them perform live on the #MorningAir! This entry was posted in Articles, Entrepreneurship and Business and tagged business, entrepreneur, music, radio, show business, talk. Bookmark the permalink.